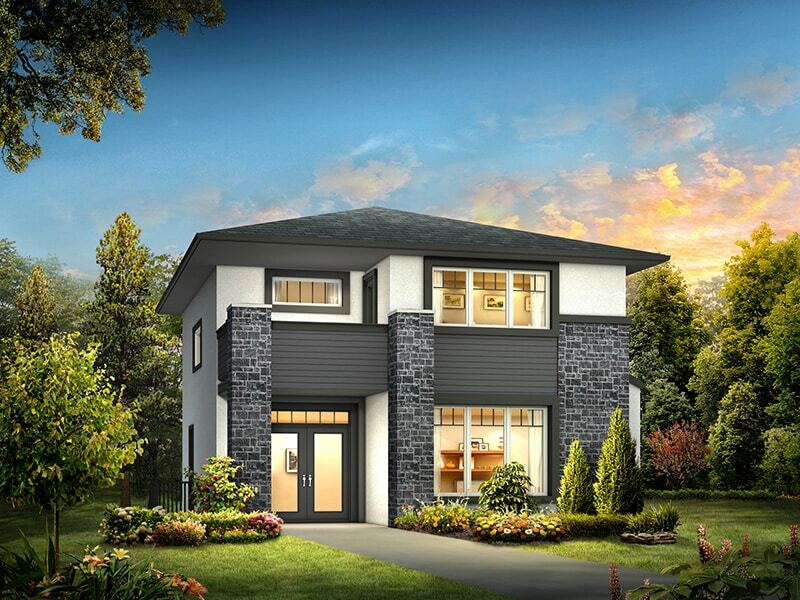 The Venezia is an A&S Homes 2 storey, 3 bedroom, 2 1/2 bath home designed specifically for a laned lot. The main floors open concept is suited perfectly for entertaining with its large great room featuring a built in maple entertainment unit and gas fireplace with ceramic tile surround. The kitchen boasts stained maple cabinetry, granite countertops, an enlarged 7 ft raised bar island, tiled backsplashes, a built-in custom pantry and hardwood flooring throughout. The master bedroom features a private balcony, a deluxe ensuite with a 5 ft enlarged glass/tiled shower, and a large walk-in closet. The two large cultured stone columns at the entrance of the home with the double glass doors and abundance of windows makes the wood trim detailing shine. Square Footage: 1,585 sq. ft. Built in maple entertainment unit and gas fireplace with ceramic tile surround.